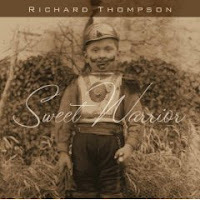 Songwriter, guitarist and singer Richard Thompson has had one of the most consistently productive careers in popular music. His wry singing and composing and stinging guitar playing continue apace on this fine album. Leading off with a some very good songs detailing the foibles of the man-woman relationship (a Thompson specialty) "Needle and Thread" and the painfully funny "Mr. Stupid" it's clear that this is going to be a special album even by his high standards. But it's the haunting social commentary of the songs "Guns are the Tongues" and "Dad's Gonna Kill Me" which prove how extraordinary this record really is. Decrying the violence and stupidity of war and terrorism, he never resorts to cliche, but draws powerful conclusions that ring true long after the music is over. This is a truly excellent album of contemporary rock 'n' roll and deserves to be heard by anyone who appreciates finely crafted music. Thompson's music isn't glamorous or flashy, but cuts to the bone with a powerful message.